Ever since I was a little girl, I have always loved the Jurassic Park franchise. Growing up, I was borderline obsessed with dinosaurs and has so many little action figures. I knew the types of dinos, what they ate, and how they ranked on the food chain. Throughout the years, I watched all the Jurassic Park movies on replay know them like the back of my hand. You bet I was beyond thrilled when they introduced the Jurassic World movie and expanded it to the newly released Jurassic World: Fallen Kingdom, which is now available on Blu-Ray! The excitement I felt as Owen and Claire revisited the park was so exciting–what dinos would they find? What was lurking around the corner? If you LOVE the pit of excitement in your stomach while watching movies–this is surely the movie for you! It also makes for an EXCELLENT movie for a family movie night! Family movie days/nights are not a rare occurrence around here. On the weekends, we often agree to watch a family movie that we can all find enjoyable. 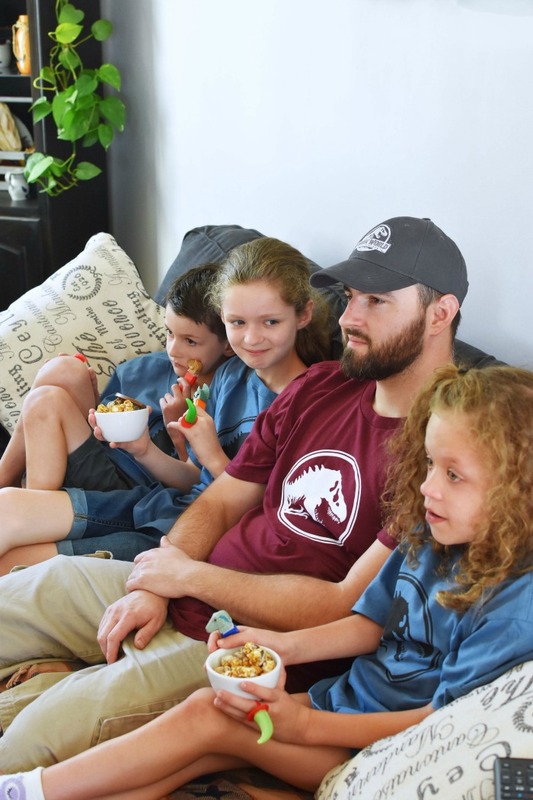 This past weekend, we watched the all-new Jurassic World: Fallen Kingdom and both Jared, myself, and the girls loved it! My son tuned out a little because there were a few scary parts that were a little frightening for him. Since this movie is rated PG-13, use caution around little ones because there are some bloody scenes and a little language that might not be appropriate. I have to admit, I already saw the movie a few times, and was there for the snacks! 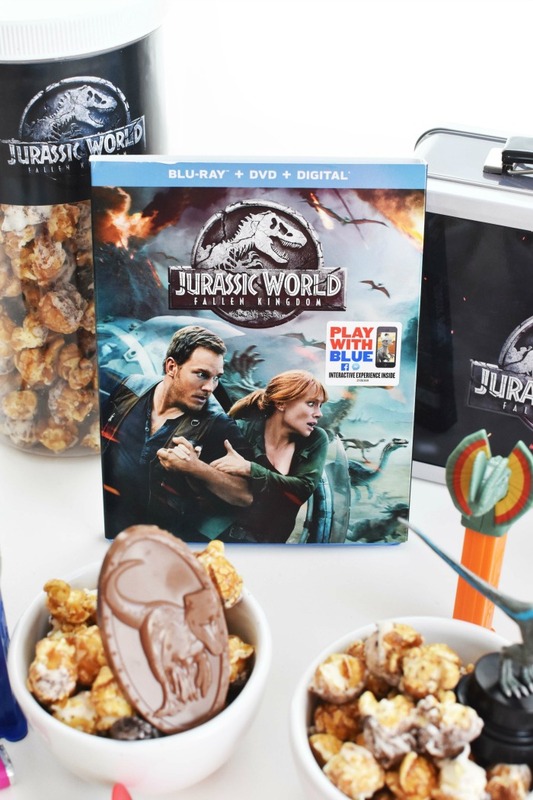 To celebrate the Blu-ray release of Jurassic World: Fallen Kingdom (in-stores now), we were sent a package of dino-mite snacks, tees, and of course, the Blu-ray movie to celebrate. 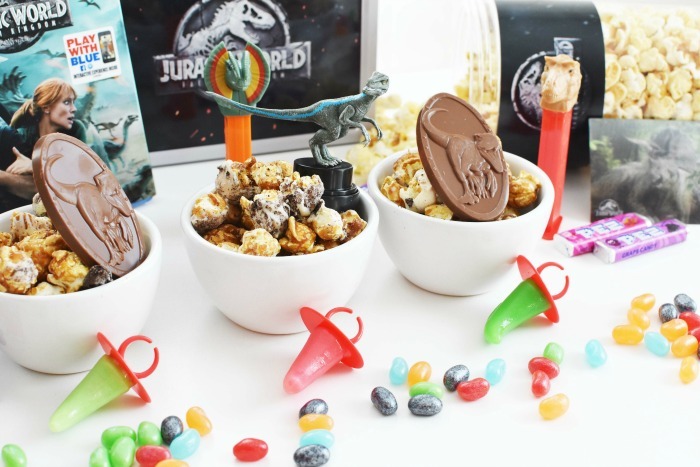 Inside our movie night box, we had candies like dinosaur Pez Dispensers, Jelly Belly Dinosaur Jelly Beans, Raptor Ring Pops, and collectible Jurassic World chocolates with movie cards. 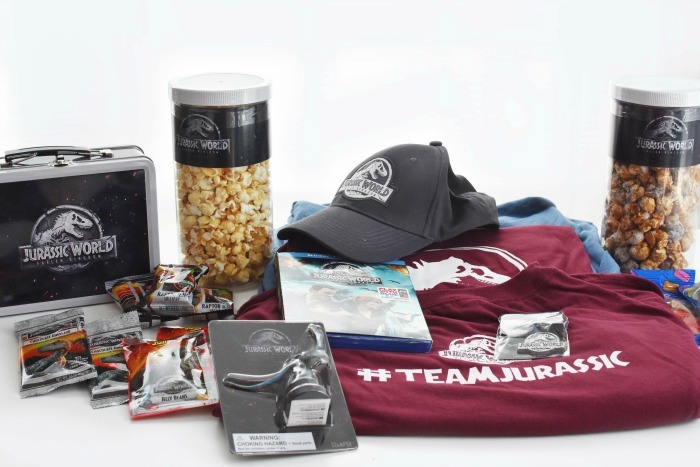 There were also two containers of gourmet popcorn, a keychain, mini dino figurine, branded lunch box, and #TeamJurassic tees for all of us. 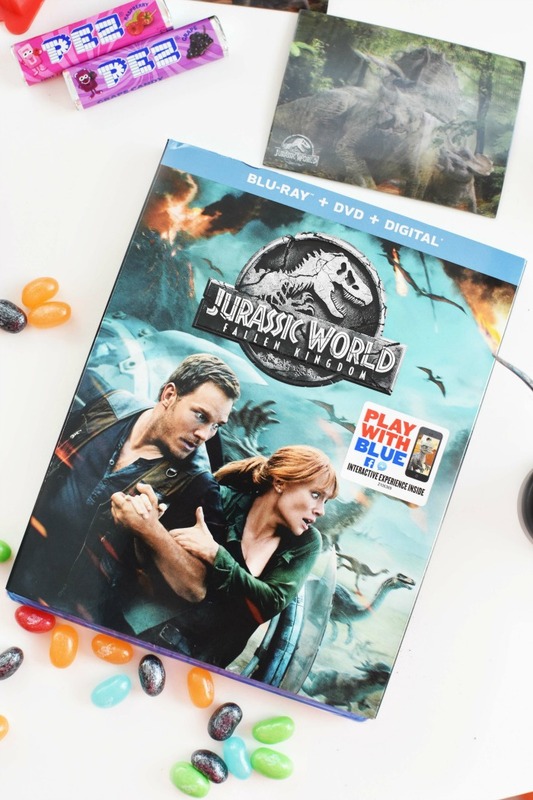 Did you know that the Jurassic World: Fallen Kingdom Blu-ray contains more than one hour of bonus content? My girls loved the behind the scenes look that Chris & Bryce shared as well as the inside look at the scary Indoraptor. 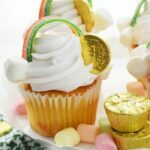 Dinosaur Rice Treats & more! Jurassic World: Fallen Kingdom is in-stores NOW! 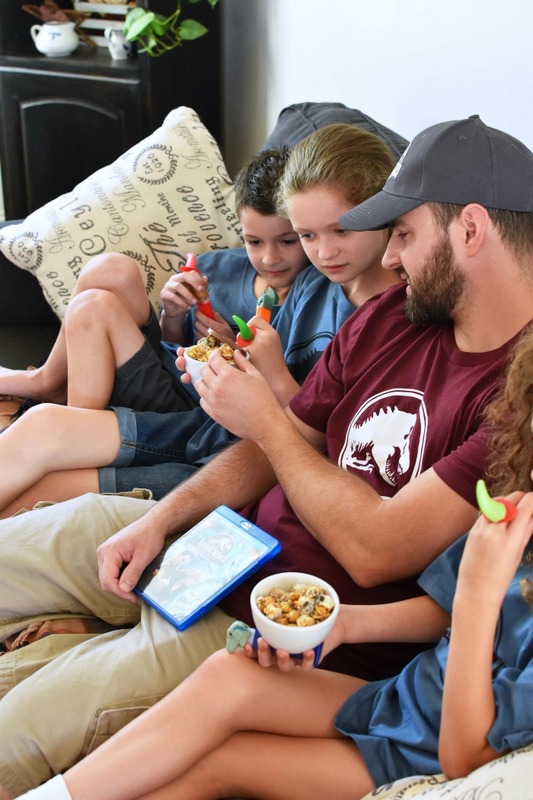 Get your Blu-ray copy today and enjoy a family movie night in. To enter, please leave a comment below letting me know how excited you are to watch this film. Or, if you have seen it what is your favorite part! One winner will be chosen at random from qualified entries. End 10/6 at 11:59 pm est. Please no spam comments. Open to US residents 18+. Please allow 8-12 weeks for prize delivery. We are not responsible for shipping. Winner will be emailed using address supplied during comment entry. That is the best movie night ever! I love all the snacks. The horn suckers are the best. I could use thrilling movie to watch with my family! 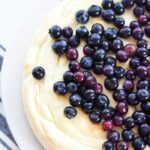 Enjoying it with some fun treats like these sounds like a good idea. I haven’t seen this movie yet but am looking forward to it. I have enjoyed the Jurassic movies in the past. I love watching the bonus content. 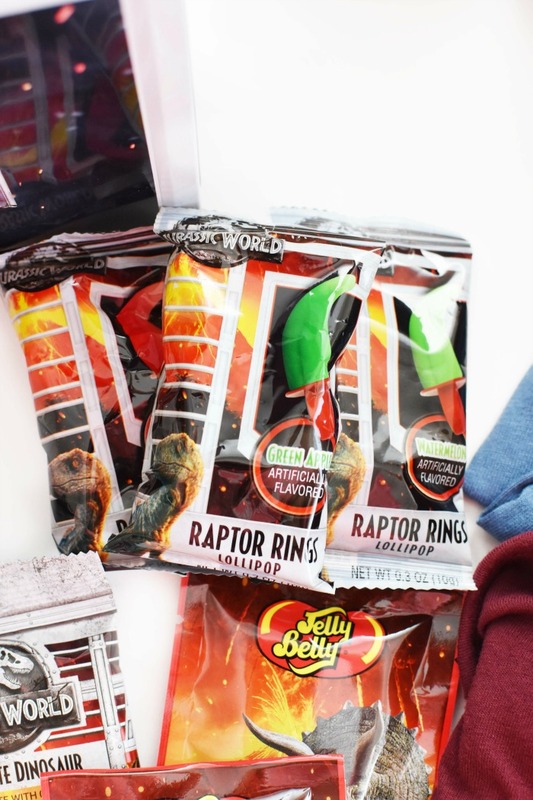 Raptor Ring Pops? Fossil Cupcakes? 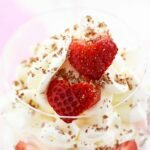 Dino Pudding…. oh my gosh. I’m coming over for movie night at your place! I haven’t seen this movie yet, so I can’t wait to see it. I saw the last one, but not this one. This sounds like one great movie night too! I want some of that food for sure! Any of those Jurassic Park movies are always an exciting watch. I have not ween this latest one but I am sure it is as thrilling (maybe even more) as the past ones. My daughter has seen this and highly recommends it. 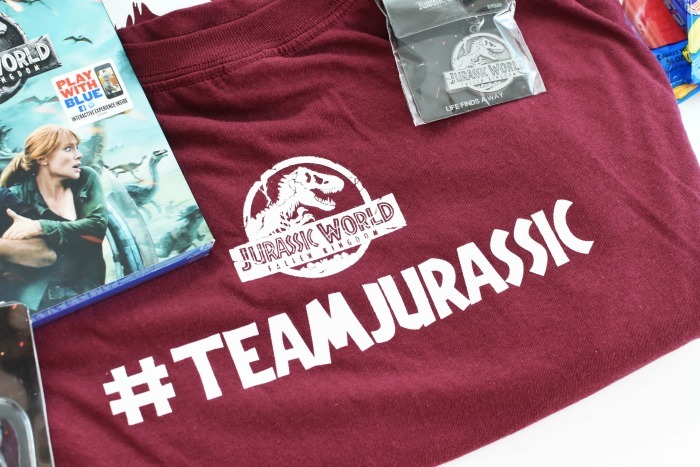 We all love Blue and look forward to this next Jurassic World installment.. Prize pack will make a great movie night. I have not had a chance to see this movie yet. It looks great. We are big fans of the original Jurassic Park movies, so this one should be a hit with the family. I’ve loved all the Jurassic movies and can’t wait to watch this one with my family. I haven’t seen this movie yet. My husband and I love these movies. I would love to have a date night and watch this at home when the kids go to bed. I would really enjoy watching this movie. Don’t get to the theater much! I am super excited to see it. I loved the first ones but have not gotten a chance to see this one! great it is! This is a fun prize pack I love it! I watched Jurassic World Fallen Kingdom and enjoyed it. My favorite part was at the end when the dinosaurs got released from the building. We loved the last one, so can’t wait to see this. I would love to see the movie. Have have seen all the rest. This would be amazing to win to watch with my family. I have not seen it yet but would love to. Thank you for the chance! I have seen all of the movies and still a super fan from the first and to the last. I would love to watch that film! And eat those snacks! I have not seen it yet, love the prize pack, hope to win! My kids really want to see this!! I haven’t seen it yet. I want to watch it with my nephew. I really want to see it as I loved the first one. I’m excited to watch it! I’ve seen the first reboot, but not this one. I haven’t seen this movie yet, but I’m so excited to see it! We havent seen the movie yet but we really want to see it. The food and snacks look really good. I haven’t seen it, but I am excited to! Excited to see this, seen the other Jurassic movies, looking forward to this one. I am very excited about watching this film with my family! Love Jurassic World and am eager to see the Fallen Kingdom. 🙂 Thank you. I’m EXTREMELY excited to watch this film. I can’t wait to see it. Thanks for the giveaway! A tornado hit my business in mid June and I was heavily involved with the cleanup. I did not get to see this movie when it was in theaters. I would love to win so I can watch it with my nephew. He is a big fan of Jurassic Park. I have seen this movie yet. I would love to see it. I love all the Jurassic Park movie. 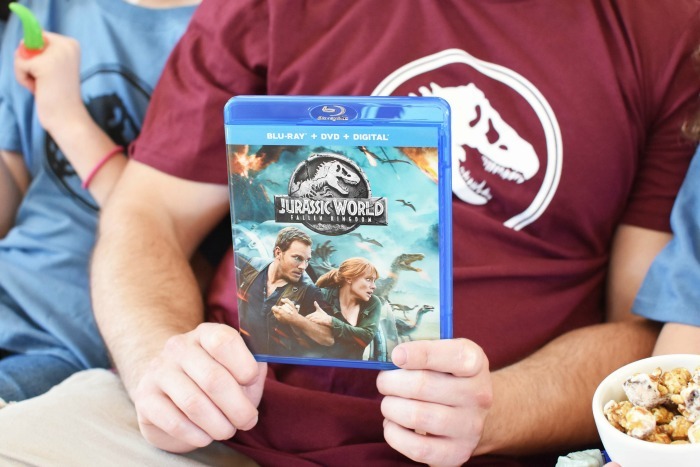 I can’t wait to watch Jurassic World Fallen Kingdom with my kids it’s perfect for family movie night. We are super excited to see it. We have been watching the “Franchise” and love it. I am super excited to watch this movie with my son! We’ve been watching the Jurassic movies since he was really small and they never get old. This will be a fabulous movie night! We have watched and enjoyed all the previous Jurassic Park films, so we are looking forward to seeing this new one as well. Thank you for the chance to win. I haven’t seen this movie yet but am looking forward to it. I have seen the previous Jurassic movies. I have not seen it, but have seen all the other Jurassic movies. Can’t wait to see it! My dad and I love watching the Jurassic Park series, we have yet to see this. Thanks for the chance to win this great prize pack! My family loves the Jurassic Park movies, all of them are good! I am excited to watch this movie with my family! 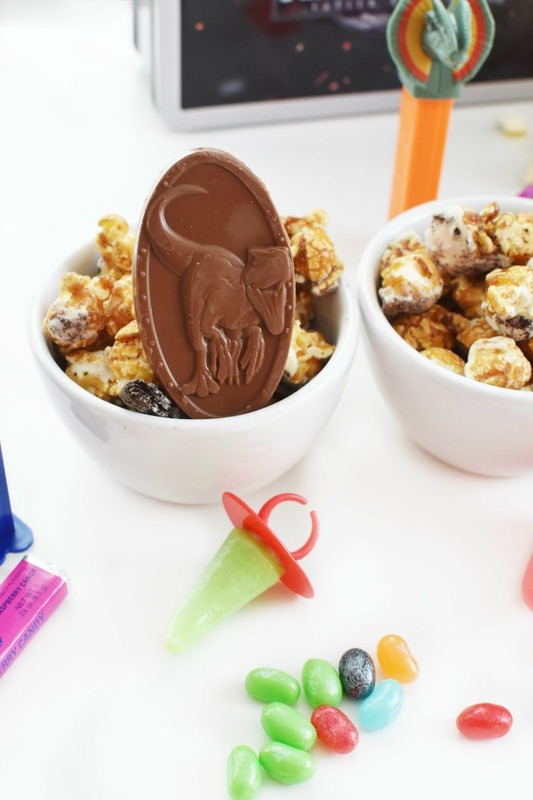 Love all the dino-themed snacks, too! I am super excited, love all the Jurassic Parks and the promos look amazing for this one!!! Thanks for the chance to own it! OMG! I am so excited to see this movie! I love the whole series. Pick me! I did see the movie and loved it. I couldn’t watch when they leave the dinos on the island. I cried. My family and I are huge JP fans — we saw the movie opening night — and a couple more times after in the theater! I cant tell you my favorite part without spoiling the twist! I would love this prize to share with my family. Thanks so much for the awesome giveaway. We haven’t seen this one yet but the original is our fav and excited for the chance to watch this and snack time! can’t wait to watch this one with my family. My family saw this in the theater and loved it. My favorite part is when Mills gets eaten by the T-Rex. i am very excited to see this, i haven’t seen it yet but i really can’t wait to see it. it looks fantastic. I am so excited to watch this movie. I did not get a chance to go see it at the movie theater. I am super excited. I love the Jurassic Park movies. They are thrilling! I haven’t seen Jurassic World: Fallen Kingdom yet. Looking forward to streaming it with my son. love these movies haven’t seen this one yet can’t wait! I can’t wait to see this with my kids and husband, we’re all excited to see it since we liked the first one. I’m very excited to see this! I haven’t seen this movie yet. 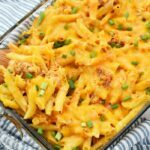 I think it would be a great pick for a family movie nightand all the snacks look yummy too. We haven’t seen it yet but we are very excited to watch it. I love the Jurassic Park movies and am very excited to see this movie. I’ve even read the books before they became movies. At one time I wanted to be an Paleontologist. Thanks for the chance to win. We love all the movies here, but It’s hard to beat the first one. We have not seen the newest one,yet. I saw this movie at the theater with my family and absolutely loved it! Choosing my favorite part is so difficult because there were a lot of great scenes. One of my favorites was when everyone (including the dinos) are trying to escape the island because the volcano is erupting. The action sequences of humans running with the dinos is exceptional. We haven’t seen Jurassic World yet, but are so looking forward to seeing it all together! Thanks for hosting an amazing giveaway for this movie. We are so excited to see this movie that my boy renamed are fish after the dinosaurs in the movie. This is the best movies ever made… love everything about them.. Saw the first one so really excited to see the second! We’ve seen all the other ones, so we really want to see this one. I haven’t seen it yet.I seen all of the other MULTIPLE times. I am very excited to see this film as my son loves movies about dinosaurs. I’m really looking forward to seeing this movie, it looks exciting. I’m excited to see this because of how happy my grandchildren will be when I tell them we are going to! I am really excited to see this with my family. I’m looking forward to sharing this movie with my son. I really loved this movie!!! I love when they let the dinosaurs loose at the end! 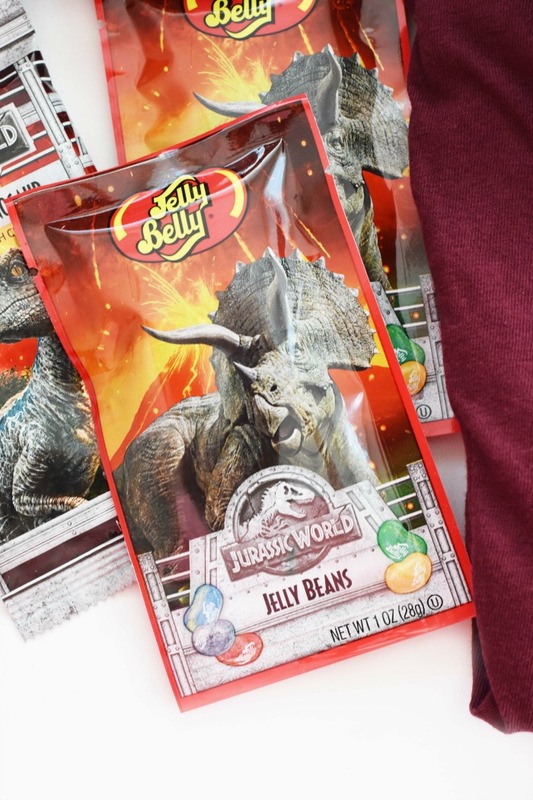 We haven’t seen it yet, but my son has been obsessed with dinosaurs and the Jurassic Park movies forever… I can’t wait to see this movie with him! I can’t wait to see this movie! I’ve been watching the first 3 Jurrasic Park movies all summer long. I would love to wear the new t-shirt, too. My toes are curling to see this movie! We are very excited to see it. 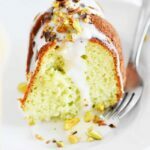 We have heard a lot of great reviews about it. We haven’t seen this movie yet! 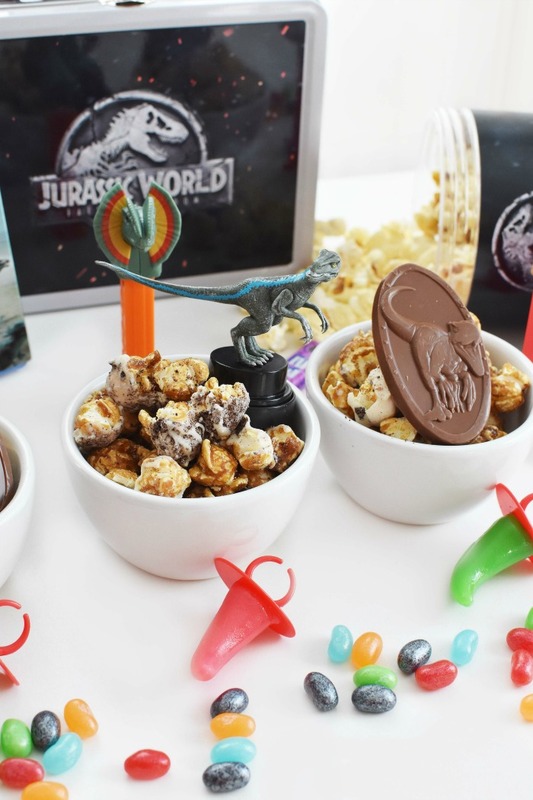 I would love to do a Jurassic Park movie night with the family!! We have loved all the Jurassic Park movies and can’t wait to watch this one with my granddaughters. I am VERY excited to see this movie. We so enjoy these movies. I would watch this with my niece’s twins. They LOVE dinosaurs! We want to see this movie we loved the other films! Looks like a good movie we could all watch on movie night. Thanks for the chance to win it! This is a great family movie as well as being educational! I watched it for the first time last night, and I don’t want to spoil anything by saying my favorite part. So I will say that the whole movie was my favorite! I saw the movie at a screening before it hit the theaters. I would like to watch it again. This movie looks so good. We have seem all the Jurassic Park movie series. Can’t wait to see this one! Ive been a fan since the first Jurassic Park, I watched Jurassic World 2 times in theatre and really want it at home! I am so excited to watch this. My daughter and I are planning to go. We will make an evening out of it! I love all the Jurassic Park movies, and I cannot wait to see this one! I’d love to watch this movie with my kids. We’re excited! I am very excited to see it. I haven’t seen it yet but have seen all the other movies in the series. Now this is a womderful sweepstakes. Im like all these folks. Im in love with J. Park. All movies. I saw this one. I had to order it online and stream.im 60 so.. but i figured it out. My favorite parts is the sadest but i liked the dinosaurs when the volcano blew up. Oh my goodness. I had to stop it. It broke my heart that them n their home is lost. Bit that what i wanted to see was all the dinos. Wonder where the next movie takes us???? ?